The division consists of four sections. 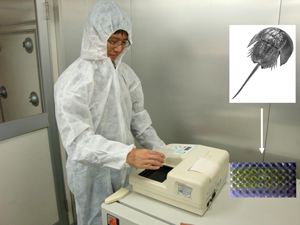 It is engaged in microbiological testing and examination for the control of contamination in drugs and medical devices, food-poisoning caused by bacteria, and development of analytical methods for bacteria and bacterial toxins. The activities are establishment of standard analytical methods for measuring mycotoxins. In addition, the division conducts research into the biological and chemical analysis, biochemistry and genetics of bacteria, fungi and microbial toxins. Limulus test using a lysate of blood cells from the horseshoe crab is used to detect endotoxin in pharmaceutical products. 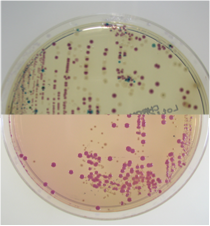 Effective detection methods for foodborne pathogens using their characteristics are developed and evaluated. Do the fungi produce carcinogenic mycotoxins ? 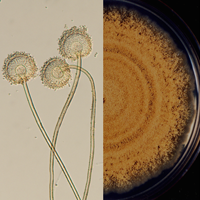 Left panel: an optical microscope image of Aspergillus ochraceus. Right panel: a typical colony of Aspergillus ochraceus; a kind of mycotoxin-producing fungi. 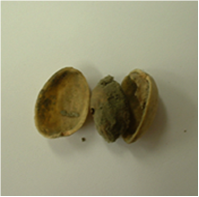 Fungi associated with food spoilage and mycotoxins are studied. COPYRIGHT (C) 2006 National Institute of Health Sciences ALL RIGHTS RESERVED.